from veesvision in the BViB photo pool on flickr. 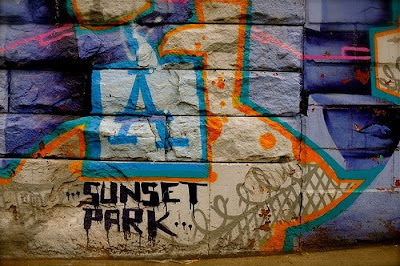 Sunset Park doesn't have a lot of graffiti compared to many surrounding areas. And we are happily less than plastered in stickers that come from the need to get a message across while blocking someone else's message. 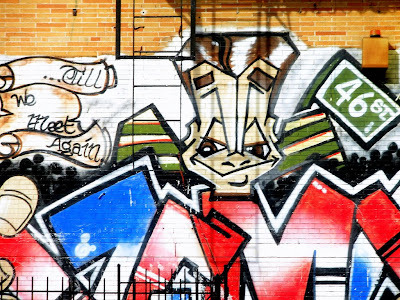 However, we do have a few areas that have some street art that's worth seeking out. LoisinWonderland added the three photos below to the Best View in Brooklyn photo pool on flickr. A little of everything in varying degrees. They are great shots, and she has tons more from around the City on her photostream and her blog. First, you have an example of the paid for murals. They are usually in memoriam, but sometimes commissioned, or at least allowed, by a bank or a store. This one is on 46th and 5th. There is a large memorial portrait next to it. 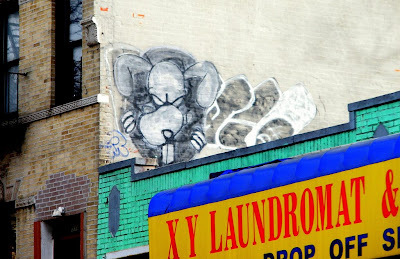 Then you have your more typical graffiti, although, compared to most of what's around Sunset Park, this is stellar. I am not quite sure if it's an evil Pluto the dog, a rat, or an angry rabbit. Anyone know? And then we've got a few stencilled works. This one is Mexican, judging from the DF reference. Was Mario Mexican? I never played the game, but I thought he was Italian. Maybe it's his look-alike cousin. I know opinions vary widely on graffiti, but I think there's a great difference between scrawling your mark across someone else's property and creating something that is at least marginally amusing or attractive. If you're digging the Street Art in Sunset Check Out the Movement At Buendiaproductions.blogspot.com. Even Council Member Sarah Gonzalez is showing her support for our work. Thanks for the heads up and the link. I just assumed that the DF was in reference to Distrito Federal. 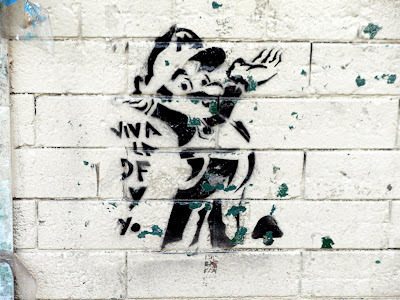 I'm still pretty sure that's what it is referencing, but I'm the last person to claim expertise in street art or Mexico. I rely on my friends and acquaintances.